The blockbuster movie makers of Star Cinema and Viva Films collaborated to make another Filipino romantic comedy hit... Catch Me, I'm in Love. 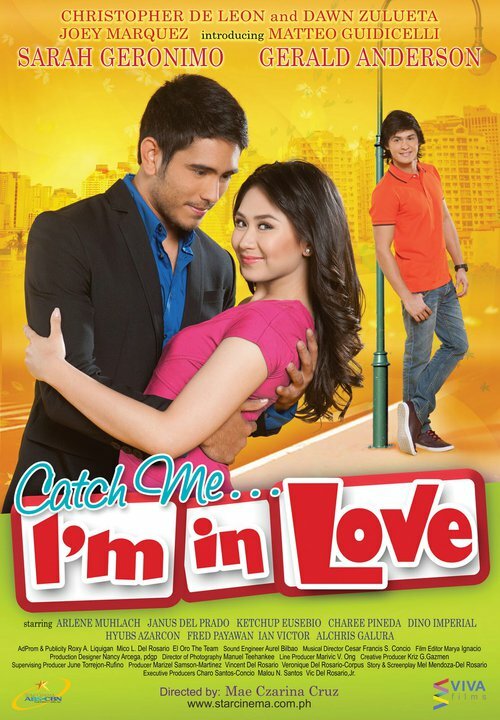 Roan (Sarah Geronimo), an average working Filipina falls in love and later on becomes the girlfriend of the President's son, Erik (Gerald Anderson). Their relationship started off really good and romantic. However, reality sinks in when they finally realized that they live in totally different worlds. Differences, personal issues and even insecurities start to come up and the only way to save the relationship is to deal with all of them. It was another typical Filipino romantic comedy. I do not intend to compare it to other American movies as this is solely directed to the Philippine masses. The story was just plain and straightforward but it never failed to emphasize the romantic part of the story which I believe is what Filipino audiences are up for. It gave me a lot of smiles and a number of giggles at some scenes by the way. The Gerald-Sarah tandem worked really well too. They had this good chemistry which I believe was pulled by Sarah Geronimo's light and bubbly personality. This was also the most mature role I think Gerald Anderson ever played in a movie. Overall, this movie is not for those with high expectations on romantic movies. It was just a feel good movie and it's worth watching if you need a break and would like to get a few giggles from some romantic moments you could ever possibly remember or relate to. On a good note, the movie also presents some good lessons in relationships though. And for that, since I think it was still good anyway, I would give it a fair rating of 7.